1916 Rebellion Museum | Creating a National Monument to commemorate Ireland's 1916 Easter Rising. Save 16 Moore Street aims to save numbers 14, 15, 16 and 17 Moore Street. Commemorating the events around the genesis of our State, which unfolded in Moore Street in the latter days of Easter week 1916. The story of the surrender. in its context as an appropriate memorial to the events and people associated with the end of the 1916 Rising. Ensuring the protection of Number 16 Moore Street, and the National Monument buildings of 14,15 and 17 Moore Street. Click here to watch an overview of our campaign. the last headquarters of the Provisional Government of the Irish Republic. Ensuring the protection of Number 16 Moore Street and its immediate environs. Proposed plans for the commemoration centre and regeneration of Moore Street. Save 16 Moore Street aims to save numbers 14, 15, 16 and 17 Moore Street. Number 16 was the last headquarters of the Provisional Government of the Irish Republic. The Save 16 Committee (hereafter ‘Save 16’) was formed at a public meeting in 2005 with the specific aim of protecting, restoring and preserving No.16 Moore Street in its context as an appropriate memorial to the events and people associated with the end of the 1916 Rising. Members include several dedicated activists, including descendants of participants in the Rising such as John Connolly, a grandson of James Connolly, two great-granddaughters of James Connolly, and a great-grandson of The O’Rahilly. The Committee was convened not least in response to the alarming fact that planning permission had been granted to a previous owner for the demolition of No.16. The Committee made representations to elected officials, property owners and others and succeeded in preventing the demolition of No.16 and in getting it placed on the Register of Protected Structures. 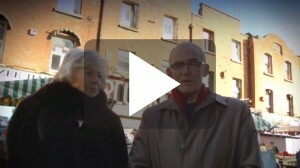 Then, in 2007, Save 16 successfully petitioned the Minister for the Environment to have the site comprising No.s 14 – 17 Moore Street designated a National Monument. To lend your support and keep up to date with our campaign sign up for our mailing list. Visit Ireland Calling to read several articles that offer an in depth look at the Easter Rising. Article by Diarmaid Ferriter, The Irish Times Feb 5th 2016. 1916 Rebellion Museum, Save 16 Moore Street Committee, 16 Moore Street, Dublin 1.